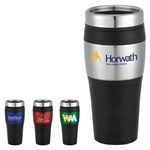 LogoToYou.com carries a big variety of travel mugs, including acrylic, porcelain, stainless steel, insulated, plastic and more. All our products are expertly designed to keep your beverages piping hot or perfectly chilled while proudly displaying your customized logo or text. 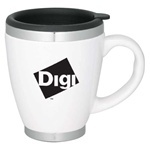 Logo Imprinted Mixer Shaker is made of 100% BPA-free plastic. 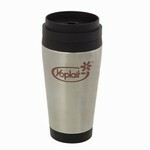 Custom Stainless Steel Imprinted Beverage Carrier 16.9oz is made from stainless steel. 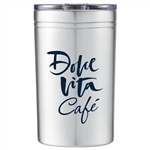 Custom Sedona Imprinted Tumbler 16oz is made from stainless-steel and polypropylene plastic. 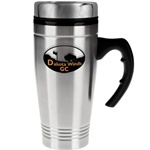 Custom Imprinted Vance Tumbler 14oz is made from stainless-steel, acrylic, and polypropylene plastic. 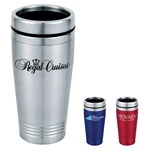 Logo Imprinted Emerson Tumbler 15oz is made from polypropylene plastic and stainless steel. 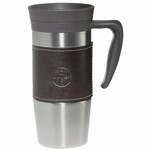 Promotional Steel City Beverage There Piece Set comes with two travel mugs and one ½ liter insulated beverage carrier. 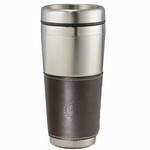 Custom Beverage Steel City 3-Piece Set is made from stainless steel. 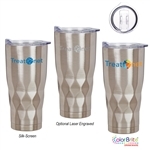 Promotional City Beverage Steel Three Piece Set comes with 2 city steel super saver travel mugs and one 1-liter vacuum insulated stainless steel beverage carrier. With handy snap on lids, and available in a range of colors, these items put the ‘fun’ in ‘functional’. Some of our custom travel mugs feature straws or handles, perfect for marketing to parents or families with small children. Both these features are great for adults, too, as straws make spills less likely, and handles offer a more professional, corporate look. 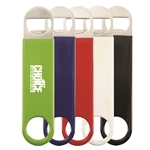 These fantastic marketing tools are economical and vibrant, offering on-the-go drinkware that is ideal for conventions, tradeshows, seasonal giveaways, and even the office canteen or break room. Save on costly marketing plans and order our custom products, printed in high-quality with your logo and business name. These items are bound to get you noticed, and so useful that they won’t be wasted or discarded. Our travel mugs are perfect for any occasion. Choose colors that complement your branding and have custom drinkware printed with messages, dates, titles, names, quotes, or images. If you own a coffee shop, why not serve your customers in stylish on-the-go cups complete with snap on lids and insulation—or make them available for sale at checkout, the perfect add-on item to increase your cash flow. Reusable and durable, drinks will remain fresh and warm; when the beverage is finished, these items are quick and easy to clean. Customizing your choice is extremely straightforward with our online tools. Select the style, material, and color you want, and upload your artwork or logo. Choose the shades that best fit your brand, select fonts, and graphics, and we’ll supply free proofs so you can see exactly how your order is going to look before printing starts. We also offer a free art consultation and excellent customer service. What’s more, place a repeat order for customized travel mugs within one year of your original order, and we’ll offer free exact re-order setups. If you have any questions, please contact our sales team. At LogoToYou.com we are committed to providing high-quality, long-lasting, and safe products at an affordable price. These cheap travel mugs can display your logo on a product that people use every day. We will work closely with you to ensure you get the products that accentuate your brand, and we never go to production until you’ve given us your 100% approval on all the artwork. Take a look at our current selection and start designing the best customized mugs today. You can also get some free samples of our products to experience the quality for yourself.